She fled after FBI agents warned she was in danger, the newspaper wrote. Depictions of the Prophet Muhammad are forbidden in Islam. The Seattle Weekly wrote that Ms Norris was "moving, changing her name, and essentially wiping away her identity". "She is, in effect, being put into a witness-protection programme," it said, but without government aid. "She likens the situation to cancer," the paper wrote. "It might basically be nothing, it might be urgent and serious, it might go away and never return, or it might pop up again when she least expects it." Told by agents to keep an eye out when in public, the paper said Ms Norris responded: "Well, at least it'll keep me from being so self-involved." In her cartoon, Ms Norris satirically proposed 20 May as an "Everybody Draw Muhammad Day". The idea inspired a separate Everybody Draw Muhammad Day group on Facebook which rapidly grew in popularity. The page contained drawings and cartoons of the Prophet Muhammad and characters from other religions, including Hinduism and Christianity. 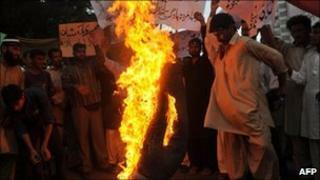 It sparked outraged protests in Pakistan, where a court ordered Facebook to be blocked.